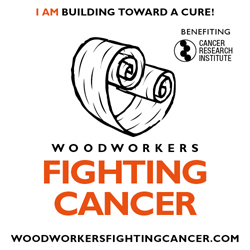 It’s that time of year again: the 2014 Woodworkers Fighting Cancer fundraiser brought to us by The Wood Whisperer Team of Marc & Nicole Spagnuolo. In 2013 Woodworkers Fighting Cancer raised over $14,000. This year the goal is $15,000 and The Wood Whisperer Team is confident they’ll reach it. Over the past few years Woodworkers Fighting Cancer have built a number of fun projects in the name of fundraising to find a cure for one of the most insidious diseases we’ve faced…CANCER. Projects ranging from a shaker side table, to a rocking horse, and then last year’s child art easel. Along the way, hundreds of woodworkers have participated and shared their versions with the online community. This year the project is a cool little toy chest, and all proceeds are once again going to the Cancer Research Institute. The official plans for it was released yesterday so if you want to get started right away to help hit that $15,000 goal visit the Woodworkers Fighting Cancer page at www.woodworkersfightingcancer.com. Thanks for participating and more importantly, have fun in the shop while doing something to make a difference!